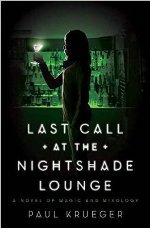 With Last Call at the Nightshade Lounge, Paul Krueger bursts onto the urban fantasy scene with a premise so amazing it’s a wonder no one’s done it before: superhero bartenders powered by magical cocktails. Bailey Chen discovers the world of superhero bartenders powered by magical cocktails as protagonists often do: by accident. While being the smartest barback at the Nightshade Lounge, she makes herself a perfectly proportioned screwdriver, downs it, and gets superstrength. Which comes in handy when she encounters a soul-sucking skinless demon. So it turns out that when her coworkers are taking “smoke breaks,” they’re actually taking “save-the-world breaks.” But does Bailey want to be a world-saving bartender, or does she want to make her parents proud with a “real job” that involves lots and lots of spreadsheets? In typical origin-story fashion, Bailey gets told the rules of the world by various people, she finds a mentor, she trains to use her powers, and so on. It’s not until the halfway point that the major conflict of the book emerges, but I didn’t mind because Bailey was so likable and had such relatable twentysomething issues as “I haven’t seen my best friend from high school since graduation and now I think I’m into him? ?” and “I am still living with my parents and I don’t want to see them make out.” Plus, Krueger deftly sprinkles plot points throughout so when the book shifts from “Introduce the world” to “Solve a problem,” it’s clear the problem has been there all along. He supplements the narrative with real cocktail recipes and fictional cocktail lore, creating a whole alternate history with events like the Great Hangover and the Blackout. I love how much thought Krueger has put into this magic system—different alcohols and mixers are associated with specific powers—but I admit that I found it hard to take seriously at times. The premise is just so absurd—and Krueger, naturally, can’t resist wonderful puns like calling a group of soul-sucking demons a delirium of tremens—that the small moments of self-awareness aren’t enough to completely smooth out the tonal imbalance. Honestly, though, that’s a flaw I can live with, because this book is fun, and we need more like it. Bailey’s personal conflicts hit home, and the danger to Chicago feels real enough, but overall it’s a light, enjoyable read with positive LGBT representation and the most action-packed Dumpster scene in all of literature. It’s got superpowered bartenders hurling lightning and flame! Why isn’t this happening in every book? So when Paul Krueger hands you a Collins glass of magical mixology, diverse characters, and tight plotting, do not throw away your shot. Hailed as the spiritual successor to The Man in the High Castle, United States of Japan imagines an alternate history where Japan won World War II and the Japanese Empire rules America. The Los Angeles of 1988 is practically unrecognizable, not to mention far more technologically advanced than even the near future—it’s got everything from portable death rays to genetically modified killer Pomeranians—but there are people who believe in America as we know it, the country that was and the country it would have become. A rebel group known as the George Washingtons has released a video game called United States of America that shows World War II as if America won—an alternate reality to them, the actual reality to us. This is the revisionist history within the revisionist history. Chinese-Japanese video game censor Beniko Ishimura and French-Korean Tokko agent Akiko Tsukino—neither one full-blooded Japanese yet both fiercely loyal to the Emperor—have a common goal: find out who’s behind this seditious video game and shut it down. Ben is compelling because of his past, and Akiko is compelling because she will literally kill anyone at any moment probably. Theirs is not a simple task, as an investigation into one suicide leads them into danger upon danger . . . and forces them to question their own loyalties. Anyone lured by the enticing cover will be disappointed in the overall lack of Pacific Rim-style mecha action. It’s not until halfway through the book that you get to see a giant robot throw a tank at some other tanks, then slice a tank up with a sword, and it’s awesome, but this book is not about mechas. 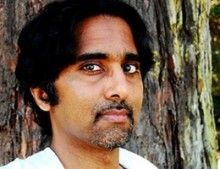 It is about empires. The horrible folly of empires and what unquestioning loyalty does to society and individuals. Peter Tieryas criticizes the Japanese Empire relentlessly, and even though the George Washingtons cling to the American Dream, it’s not immune to criticism either. This is a brutal book that pulls no punches, that compares humans and their religions to bacteriophages, that makes you rethink everything because this book is revisionist history; it is a virus that infects your mind with a new reality in which the truth is what the government says it is and if you disagree, here’s a knife with which to commit ritual suicide. Though my familiarity with Japanese culture comes mainly from their media, I appreciated how much that culture seeps into the book. A green-haired man with heightened emotions feels like he stepped out of an anime; the offbeat style of metaphor reminded me of light novels. Yet I was constantly thrown out by Tieryas’s insistence on awkwardly defining every Japanese word in the text rather than providing a glossary at the end; many are also defined by context or could have been. In an otherwise immersive book with a richly crafted world, it hinders the reading experience. 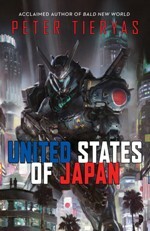 United States of Japan takes some time to get going, but once it does, it’s a hell of a ride, with multiple POVs and plot twists as history is written and rewritten right in front of you. It’s a challenging book with an ending as powerful as the iron grip of the godlike Emperor. In an election year where we Americans are pondering the strange, outdated mechanics of our own government—what’s the deal with superdelegates? 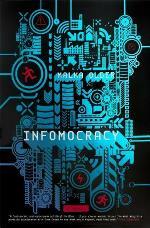 ?—Malka Older posits a whole new model of governance in Infomocracy, which may be the most important book of the year. Imagine a world where “countries” no longer exist. Instead, the world is divided into micro-democracies called centenals, geographic locations containing one hundred thousand people, each one governed by a separate body such that you could drive through Jakarta and pass through several centenals, the laws changing wildly as you cross the borders. Predictably, some of these governments are corporations like Philip Morris, but some have the citizens’ best interest in mind like Policy1st. (Obviously branding is key.) Every ten years, the world holds an election that determines which of these many governments holds a Supermajority. Heritage has been effectively ruling the world for twenty years, and it’s election time. But wait, there’s more: Information, a separate, unregulated entity, controls all the world’s, well, information, as if Google got too big for its britches and now manages all your personal data and runs the election.
. . . What could possibly go wrong? Ken, an up-and-comer at Policy1st; Mishima, an Information operative; and Domaine, an anti-democratic civilian, are about to find out. And in Domaine’s case, likely have a hand in it. Infomocracy is a political thriller that is really, truly about politics. The nitty-gritty of politics: campaigning, debates, voting, etc. It’s about how the sausage gets made, not the actual sausage. This is a book for the politics geeks who obsessively refresh FiveThirtyEight.com. Admittedly, I am not one of those people (everything I know about politics I learned from The West Wing), and as a result, I had a difficult time following the book. Older thrusts the reader into her world and rarely, if ever, slows down to explain it; it took me nearly eighty pages to get a handle on who was working with whom and why, and that was because of a debate in which participants gave thirty-three answers simultaneously and I could see whose “side” people were on. Even when the main event—the election—kicked into gear, I found myself lost, and yet I could not stop reading because of the incredible energy behind every word. I waited for the next laugh-out-loud line about elephant coitus, the next wry character observation, the next surprising development that I might not understand the specifics of but that I knew would make things more complicated. Infomocracy has the slick language of Snow Crash, the complex global politics of Persona, and the chaotic storytelling of Moxyland. It’s bold as hell and never boring, practically dizzying. Yet at its core it asks the reader to think about the very nature of government, who we put in charge, and what they will do to seize and/or maintain their power over us. In the kingdom of Bharata, Mayavati is the most notorious of the Raja’s many daughters, for her horoscope portends a marriage that partners her with death. This fate follows her wherever she goes, from the harem wives in the hallways to the potential suitors from other kingdoms. But when the day finally comes to choose her husband, a mysterious hooded man named Amar whisks her away to the Otherworldly kingdom of Akaran to be his bride—his queen. At times The Star-Touched Queen was so gorgeously written I wanted to die. Every few pages, I would hit a line like “I wanted a love thick with time, as inscrutable as if a lathe had carved it from night and as familiar as the marrow in my bones.” The last time I felt like this about language in a book, it was Sofia Samatar’s A Stranger in Olondria. While this book isn’t quite as dense with poetry, Roshani Chokshi’s words dance lightly on the page, and with each twirl of a sari, the world comes to life in your eyes and in your heart. As a fellow person of Indian descent, I delighted in the many ways Chokshi incorporated Indian culture and mythology into the story. It was like reading Jhumpa Lahiri, but now with magic! This is a book with phrases like “sweet as rasmalai,” where the main character wears a sari and rides a saddled water buffalo. You don’t understand how excited I was to see someone ride a water buffalo in a book; I love water buffaloes. My reaction highlights how important it is for people of color to be allowed to tell their own stories: They know what resonates. One chapter title references a story I loved in childhood, and seeing it used in a book as part of character development and knowing that the author also grew up with that same story means more to me than I can express. I was reminded of Cindy Pon’s Serpentine in the way both books use mythology to tell a teenage girl’s coming-of-age story; Skybright and Maya discover they are more than who they thought they were, who they were told they were. As Maya explores the realm of Akaran, she searches for clues about the identity of her new husband, who seems to treat her as familiar. Is this her fate? To be a queen? How does a girl controlled by fate control the fate of others? How can she control her own fate? 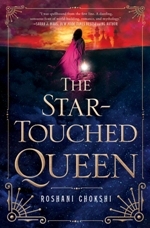 The Star-Touched Queen bursts with magic and wonder, bolstered by evocative language. Halfway through the book, Chokshi rolls up her sleeves and lets all hell break loose, and the magic and wonder give way to a somewhat darker tone. While I had been enraptured before, I lost my footing a bit because although I appreciated the plotting, the vibe had changed so dramatically that I felt like I was in a different story. The transition is smoothed, however, by the presence of a flesh-eating demon horse who now challenges Kamala Khan for title of Favorite Kamala. Maya’s magical adventure comes to an end on a strong note, as we see how this remarkable journey has changed her from the princess we meet in the beginning into the queen of the title. And we’ve been changed too, because this is a world I won’t soon forget.